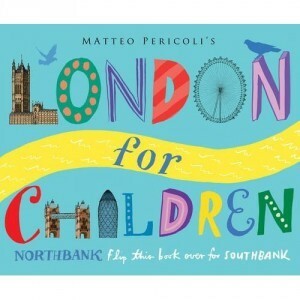 A couple of fine London books aimed at little'uns hit our desks this month. 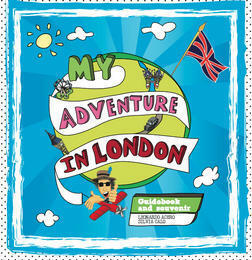 This bright, glossy book from Leo Publishing looks like it'd work well for 7-10 year olds who are visiting London for the first time. Follow Leo, a flower-shirted tourist with a goofy rictus, as he visits some of the capital's bigger attractions. The fun facts are entertaining (the London Eye rotates at a "speed twice as fast as a tortoise sprinting"). But the book really comes into its own as a scrap book for London stuff. Kids are cajoled into stick in tickets, photos, and grass from the park; the book stops thankfully short of certain messy possibilities on the page about full English breakfasts. The selection of attractions is perhaps a little too mainstream, missing out obvious child-friendly treats like the Museum of Childhood and Pollocks Toy Museum in favour of the usual A-list, but any book that encourages you to paste in your first fish and chip fork is alright by us. Amazon link. Available in hardback from Leo Publishing. See a preview on Google Books. Remember Matteo Pericoli, that fellow who drew the entire north and south banks of central London in one flagpole-sized panorama? Well he's back, with a new take on the same trick. He's recrafted the whole lot, from Hammersmith to Greenwich on both banks, but this time in attractive colours. The gaps between buildings are now populated with trivia about the capital. There's nothing you won't find on Wikipedia, but the combination of colourful skyline and "did you know?" facts will be a winner with kids. Amazon link. Available in hardback now from Macmillan. Read more London book reviews here.